We are now booking Field Trips for the 2018-2019 school year! Call 828-891-6585. Registration for our summer half-day camp is now open! Go to this google form to sign up. Historic Johnson Farm is a heritage education museum owned by Henderson County Public Schools. It is managed by volunteers and Friends of the Farm through the Henderson County Education Foundation, Inc. It offers school field trips, historic home tours, nature trails, picnic tables, animals and 10 historic structures on 15 acres of forest, fields, and streams. 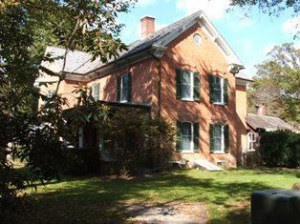 It is listed on the National Register of Historic Places and has been designated a North Carolina Cultural Treasure. The grounds of Johnson Farm are open to the public Monday–Friday, 8:00 am- 4:00 pm. 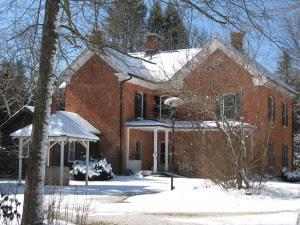 Tours of the farm house are given at 10:30 am. You must be on a guided tour to see the farm house. Visitors are welcome to walk the grounds, visit the animals, and take the audio tour on their own. The Farm follows the Henderson County Public School schedule of holidays and closings. Weekend tours and tours at other times during the week are available by appointment only for groups of 10 or more. For information about holiday closings, check out our calendar. The Heritage Weavers and Fiber Artists (HWFA) occupy the 1920s boarding house at Historic Johnson Farm. HWFA is dedicated to preserving the Appalachian fiber crafts needed to support a frontier homestead in Western North Carolina. A visit to HWFA studio and gallery is included in your farm tour. Their gallery/gift shop is open Mon-Fri, 10:00 am – 4:00 pm. They also offer a variety of classes, workshops and a kids camp throughout the year. To find out more about membership or classes visit their HWFA website or call 828-595-9475. We offer personalized tours of the 1876 farm house and a number of buildings at 10:30 AM Monday through Friday. This is the only chance to go inside the farm house. We follow the Henderson County Public School calendar, so be sure to check our Event Calendar for holiday closings and field trip days. Special Note: On many Wednesday and Fridays during the school year, we will have scheduled field trips touring the farm. On these days, the 10:30 tour will be a self-guided tour of the property. To check if we have a field trip, please see our calendar or call us. Please call (828) 891-6585 to schedule a tour. Group Rate: $3.00 per person for a group of 10 or more. Groups do not have to schedule for the 10:30 slot; they can schedule for whenever works best for their group, even on weekends! School group tours and field trips are available free of charge to teachers and students of Henderson County Public Schools. A fee is charged for students from other counties as well as private and charter school students and other summer or after school programs. Tables are available in the meadow for carry-in picnic lunches. Sorry, no concessions available. Call 828-891-6585 to schedule a tour or field trip. The farm is also an ideal setting for outings for senior groups or other organizations, such as Girl and Boy Scouts. We have a special rate available for group tours. Please call the farm office if you would like to schedule a tour. A small gift shop run by the Heritage Weavers and Fiber Artists gives you the opportunity to bring home a piece of local heritage. Henderson County Public Schools is in the process of reviewing its website to ensure compliance with Section 508 of the Rehabilitation Act and Title II of the Americans with Disabilities Act. If you have questions or concerns regarding the accessibility of the website or if you are unable to access a page or document on the website, you may contact the Technology Department at 828.890.1658.